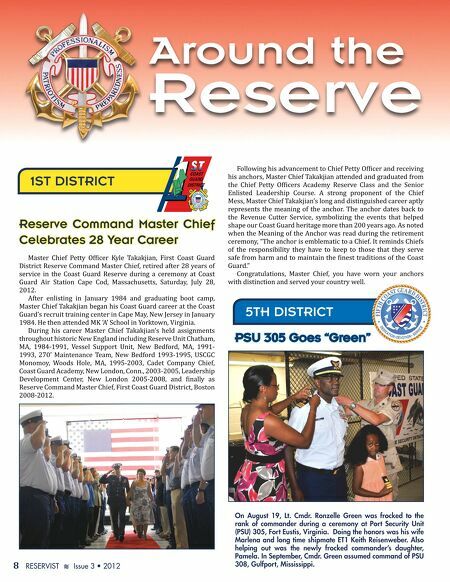 Around the Reserve 1ST DISTRICT Reserve Command Master Chief Celebrates 28 Year Career aster hief etty fϐicer istrict yle his anchors, Master Chief Takakjian attended and graduated from the hief ollowing his advancement to hief etty fϐicers cademy etty fϐicer and receiving eserve lass and the enior akakjianǡ irst oast uard eserve ommand aster hiefǡ retired after ʹͺ years of service in the Coast Guard Reserve during a ceremony at Coast uard ir tation ape odǡ assachusettsǡ aturdayǡ uly ʹͺǡ 2012. fter enlisting in anuary 19ͺ4 and graduating boot campǡ Master Chief Takakjian began his Coast Guard career at the Coast Guard's recruit training center in Cape May, New Jersey in January 19ͺ4Ǥ e then attended Ǯ ǯ chool in orktownǡ irginiaǤ throughout historic New England including Reserve Unit Chatham, ǡ 19ͺ4Ǧ1991ǡ During his career Master Chief Takakjian's held assignments essel upport nitǡ ew edfordǡ ǡ 1991Ǧ 1993, 270' Maintenance Team, New Bedford 1993-1995, USCGC Monomoy, Woods Hole, MA, 1995-2003, Cadet Company Chief, Coast Guard Academy, New London, Conn., 2003-2005, Leadership evelopment enterǡ ew ondon ʹ005Ǧʹ00ͺǡ and ϐinally as Reserve Command Master Chief, First Coast Guard District, Boston ʹ00ͺǦʹ01ʹǤ PSU 305 Goes "Green" Enlisted Leadership Course. A strong proponent of the Chief Mess, Master Chief Takakjian's long and distinguished career aptly represents the meaning of the anchor. The anchor dates back to the Revenue Cutter Service, symbolizing the events that helped shape our Coast Guard heritage more than 200 years ago. As noted when the Meaning of the Anchor was read during the retirement ceremony, "The anchor is emblematic to a Chief. It reminds Chiefs of the responsibility they have to keep to those that they serve safe from harm and to maintain the ϐinest traditions of the oast Guard." Congratulations, Master Chief, you have worn your anchors with distinction and served your country well. 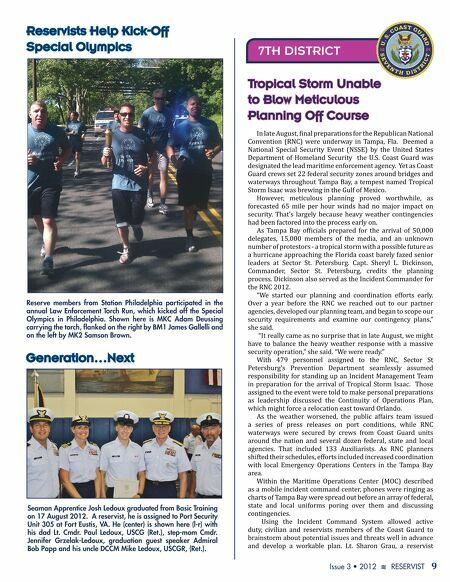 5TH DISTRICT 8 RESERVIST ᕇ *TTVF t On August 19, Lt. Cmdr. Ronzelle Green was frocked to the rank of commander during a ceremony at Port Security Unit (PSU) 305, Fort Eustis, Virginia. Doing the honors was his wife Marlena and long time shipmate ET1 Keith Reisenweber. Also helping out was the newly frocked commander's daughter, Pamela. In September, Cmdr. Green assumed command of PSU 308, Gulfport, Mississippi.